I feel like I have been waiting to write this post for forever now, but I truly care about taking the time to test drive new products out before I write a full review on them. I have been working with Influenster and Deva Curl for a while now, and have been blessed with the opportunity to be a brand ambassador for Deva Curl. A few weeks ago, I was sent a complimentary box of two of their newest products, the Deep Sea Repair & Strengthening Mask (8oz. $36) and Melt into Moisture Matcha Conditioning Mask (8oz. $36). If you’re new to Lysse on Life and are interested in some of my previous Deva Curl Product reviews you can look here and here! Over the past two to the three months, my curls have been driving me crazy! All of a sudden it seems like my curls get tangled and matted so quickly, and overall my hair lacks the healthy bounce and shine it once had. I know I should have been doing this all along, but for the first time since I’ve been ~12 I have been wrapping my hair at night. I desperate for a solution and these new Deva Curl masks literally showed up on my doorstep just in time. So, over the last three weeks, I’ve been using both of these products about twice a week. I’m going to say up front that I did not always follow the written instructions. Sometimes you gotta be a rebel, right? It felt like a lot of work for me to wash my hair, apply the Deva Curl masks, then wash it out again, AND I personally felt like it needed more time to sit in my hair. A few times I applied it in the shower right after shampooing, then washed it out when I finished showering. Other times I wet my hair with a spray bottle, then applied the mask throughout my hair trying to be as thorough as possible. Each attempt, I left the mask in for varying amount of times. 15 minutes when I decided to do it right before, or during, a shower. 3 hours when I would put it in, then put my hair in a bun before running some evening errands. Then that one time I forgot and left it in overnight. Honestly, I think I had the best results the day after this but *shrugs*. I’m not going to say that I thought either the Deep Sea Repair mask or the Matcha mask was magical and “strengthened” and “conditioned” my hair like the name says it should, but I do think it made a difference. While my hair has still been crazy tangly (honestly, I think I just need a haircut) I have seen a major improvement in its bounce and shine. If you stayed on a strict schedule, I believe these two products (or one or the other) would be very beneficial. Personally, I would purchase the matcha mask again over the Deep Sea Repair. One because I like the jar packaging, two because I could use less product each treatment allowing for the jar to last longer, and three I preferred the consistency as it was smooth and silky yet still thick like a mask. For the Deep Sea Repair mask, I felt like I had to squeeze so much out each time, the consistency seems more like a normal conditioner, and my tube is nearing its end after only five-ish uses. Obviously, this will differ depending on how much hair you have…but I have a lot. For both products, I was able to work it through my hair easily, and it washed out without leaving any additional residue. Lastly, I enjoyed both fragrances and didn’t think they were too overpowering. 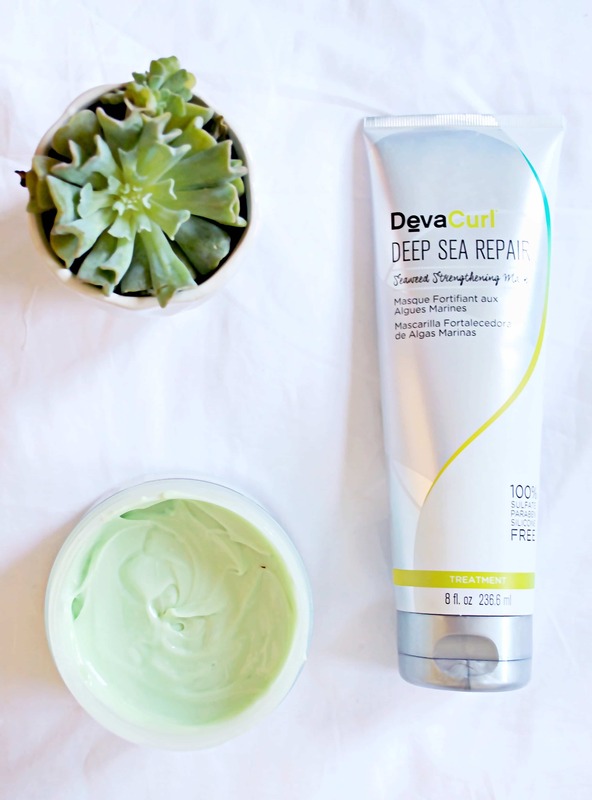 Now, it’s no secret that Deva Curl’s products are not affordable for everyone all the time. If you’re new to the brand I would recommend starting out with the products from their One Condition Decadence “No-Poo” and Conditioner line.